Ok.. I know many readers do not care hugely about this aspect, but non-the-less ... COVER LOVE COVER LOVE COVER LOVE!!! Jill Cooper ... Who ever did this cover for you is a genius. I mean seriously. This cover will draw people in and leave then dying to figure out just what magic this story contains. Natalie finds solace in her dreams, like I find solace in my books.. then again I find that how I feel when I'm reading, can easily mirror my feelings in a dream.. Sometimes I never want to wake up/ stop reading. 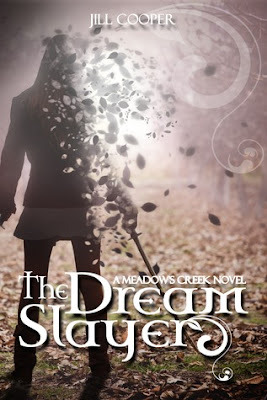 Dream slayer was an interesting blend of paranormal action blended with a story that was contemporary and full of heartache. It was easy for me to empathize with real life Natalie and root for her Dream Slayer alter ego. That being said I also found my self confused. The dream world and real world would come together at times that threw me. Then again this may just be a personal experience that other readers did not/ will not have. I cannot deny being easily distracted. Though at the same time I wish that the story had held me enough, so that I was unable to get distracted. Overall I enjoyed Dream Slayer. Though I think I will let it settle, and give it a second run through when my mind is feeling less distracted. As of right now I will not give a firm rating, because I do not feel it would be fair. However I encourage you to read other reviews on it and see if it strikes you as something you would be interested in. It is a unique story that I honestly feel will resonate with many readers! Jill Cooper has had many items donated to her, and by her for this tour, and I was lucky enough to be able to offer up this lovely necklace and bracelet combo! This is really unique book swag, and I love how it matches up with the feel of the story! To see more work by Double Designs visit them on their facebook page! I'm going to make this super easy. Just comment on this post and you will be entered to Win! Tell me if you've read the book and liked it, if you want to read the book and why. If you love or hate the cover. If the idea of YOUR dream world blending with your reality seems fun, or terrifying! Possibilities are endless. I have not read the book yet, but I want to! It sounds really good! I love the cover! Thanks for the chance to win! Loved the interview. The cover looks good I would actually grab the book based on the cover just to read the back. I have not read the book yet, but I would like to. The story sounds different from other stories I have read. If the nice dreams blended into reality then that would be great. But nightmares oh no, I don't think I could deal with that lol. I think I would really be terrified. I haven't read the book, but hopefully that will change soon. The cover looks as mysterious as the book sounds! Thanks for the giveaway.